The Florence Duomo complex consists of five monuments all connected to the city's main cathedral named Santa Maria del Fiore, but usually just referred to as the Duomo. The monuments are:the Baptistery (famous for its bronze doors), Giotto's Bell Tower ('campanile'), the Cathedral Museum ('Museo dell'Opera del Duomo'), Brunelleschi's Dome ('cupola'), and the underground archaeological site of Santa Reparata. 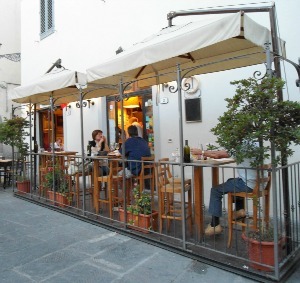 The entire complex is located in or around Piazza San Giovanni & Piazza Duomo. 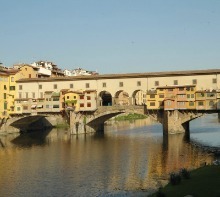 On this page you can find the answers to the most common questions about visiting these very popular monuments of Firenze. 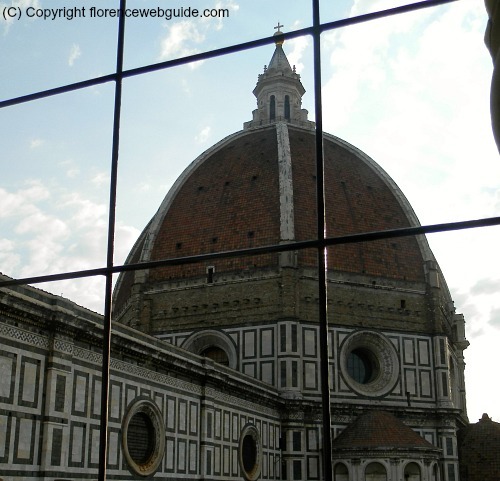 Visit the links to go to specific pages dedicated to each part of the Florence Duomo complex. Answer: There is only one type of entry fee: a combo ticket (cost €15) which allows you entry into all the monuments of the complex. 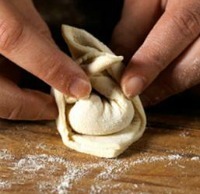 Unfortunately there are no reservations so it’s not possible to pre-book and just go in at a certain time. You can buy online tickets or go to the ticket office in piazza San Giovanni right across the street from the baptistery entrance. 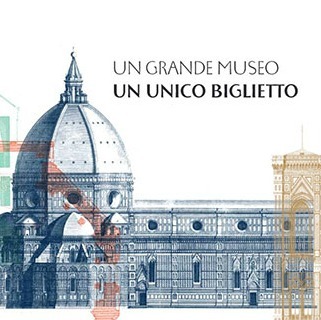 Tickets can also be bought: at the Bell Tower entrance or at the Entrance to the Crypt of Santa Reparata (IN the cathedral) or at the Works of the Duomo Museum entrance. How Does the Combo Ticket Work? From the day of purchase you have 6 days to 'activate' the ticket, which means go into any of the Florence Duomo monuments (except the Cathedral, which is free so you don't need the ticket). Once you go into one of the structures, the ticket is useable for the following 48 hours during which you can go into all the other structures (one time only). Florence’s basilica is mostly Gothic (year built 1296 - 1436) although its white, green and pink marble decoration has many Romanesque touches as well. The interior is famous for its inlaid marble floor and liturgical clock but otherwise is considered quite spartan, a noticeable contrast to the exterior. This is not entirely true however, as there is also art work dedicated to noteworthy Florentines (busts and frescoes) and beautiful stained glass windows designed by Donatello. Answer: Proper attire is a must in a holy building so your clothing should not be too revealing (eg bare shoulders and legs are no good). However, if you are not wearing appropriate clothes they usually have paper shawls you can use to cover yourself and go in. Admission fee: visiting the Cathedral is free - this is the only part of the Florence Duomo Complex which has no admission fee. The lines can be long but the queue tends to move quickly. 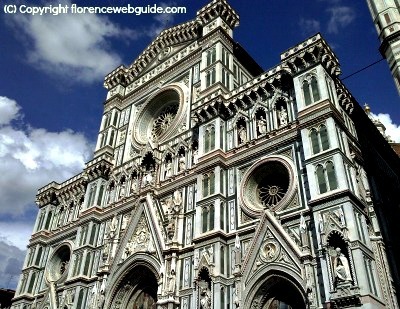 See pictures of Florence cathedral and find out all about this historic basilica! There is no line to go in the church for religious ceremonies. 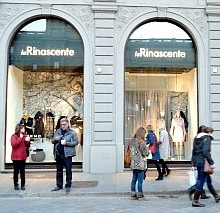 Note: For those who come downtown by car, parking is available nearby at the underground garage of the train station of Santa Maria Novella in nearby piazza Stazione. The climb up to the top of the dome is without a doubt one of the best things to do In Florence. The Florence Duomo dome climb gives you a behind the scenes view of the innovative construction and engineering thought up in the 1400's by Filippo Brunelleschi, the architect behind the cupola. Still today, this is the largest masonry dome in existence with a height of 91 meters (about 300 feet) for just the cupola alone and a width of 45 meters. Find out all about the Dome and the climb to the top with pictures! Answer: the number of steps is 463 to arrive at the lantern at the top (sorry, no elevator!). While walking up, you stop off at two balconies where you walk along the inside of the dome looking down at the Florence cathedral from above, standing right next to the painted frescoes. The history of the dome ceiling and its frescoed murals goes back to 1568 when Vasari started working on the painting of ‘Universal Judgement’ (sometimes called the 'Last Judgement'), over 100 years after the cupola was completed. The cupola climb is also the best part of the Florence Duomo complex for kids to visit: the walk up the very narrow curvy stone stairwell is a real adventure that children really get into! Entry allowed up to 40 minutes before closing time. Take a guided tour of the Dome climb, with skip-the-line entry and an expert who fills you in on all the history! Famous for its bronze doors not everyone knows that there are three sets of doors adorning the Florence Duomo Baptistery. The oldest 'porte' go back to the 1300's and were made by Andrea Pisano, followed by Ghiberti's first set of bronze doors and later the heralded ‘Gates of Paradise’, also by Ghiberti both in the 1400's. 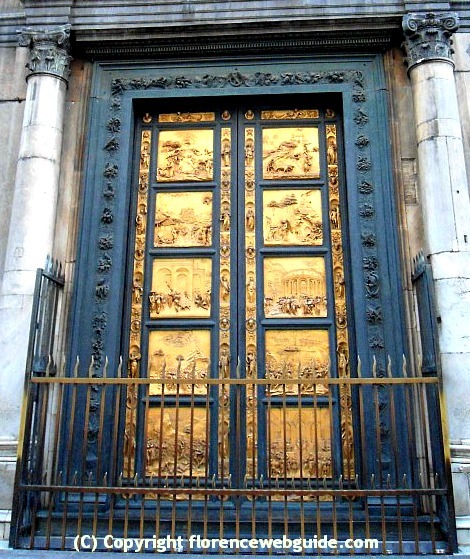 The 'Gates of Paradise' that you see on the baptistery are replicas, whereas the original Ghiberti doors - now back to their golden shine after a 27 year cleaning process – can be seen at the Opera del Duomo Museum. These reproductions however are a faithful and excellent replica of the ‘real thing’ and have one advantage over the originals: you can see and photograph them up close while the restored ‘Gates of Paradise’ in the museum are in a protective glass casing. But the baptistery is not just about its doors, and there is much more to see and know about the Florence Baptistery of St. John the Baptist. Entry permitted up to 30 minutes before closing time. 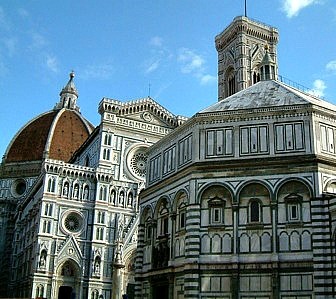 This museum dedicated to the Cathedral of Firenze is located in the OPA building. OPA stands for Opera ('works') with the letter 'P' standing for 'per' (O - Per - A). 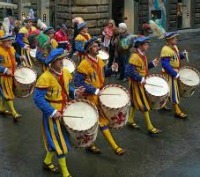 The OPA is the organization founded in about 1300 in charge of overseeing the works on the Florence Duomo. 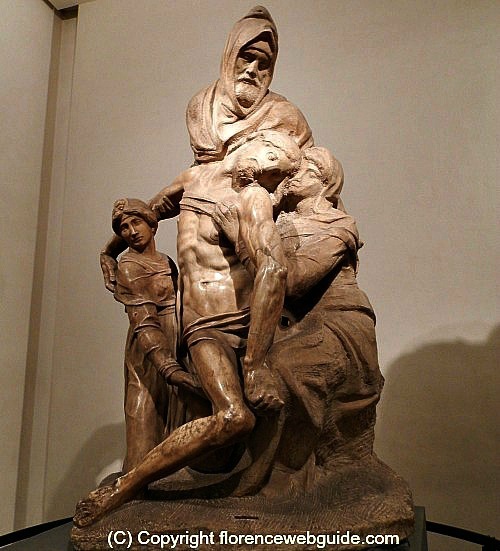 The Museum houses Ghiberti's original and restored 'Gates of Paradise', Michelangelo's 'Pietà Bandini' and works by Donatello, della Robbia and Pisano among others. This building is also the very place where Michelangelo sculpted his famous David statue, in one of the courtyards in about 1500. 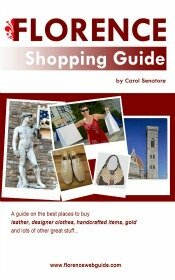 The museum location is where you will find the largest gift shop of the Florence Duomo complex, which is at the museum entrance. There is also a small souvenir shop at the Bell Tower entrance and another at the entry of the crypt of Santa Reparata (in the church). Note: due to enlargement works much of the museum is off-limits. Open exhibits include Michelangelo’s Pietà, Ghiberti’s Gates of Paradise, and the Porta della Mandorla room. Entry permitted up to 40 minutes before closing time. 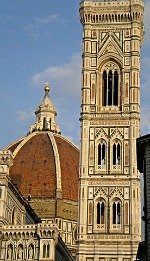 The Florence Duomo Bell Tower has 7 bells, each sounding a different note! The tower was designed and started by Giotto in 1334 and is one of the most admired landmarks of Florence. The campanile is decorated with white, green and pink marble - like the cathedral - and has three storeys decorated with tiles, reliefs and sculptures by the renaissance greats such as Pisano, Donatello and della Robbia. A climb to the top of the bell tower (number of steps:414 - no elevator) is one of the favorite things to do in Florence for great views over the city. The advantage of the tower climb is that you get to see the Dome as part of the great views of the city. Whereas the advantage of the Dome climb is seeing the architectural marvel from the inside. If I had to chose I’d say the cupola climb is slightly more exciting as you see the dome construction from between the two shells, something very unique. However, for anyone who suffers from heights, the bell tower is more protected. The Florence Duomo bell tower climb is another fun activity for kids to do in Florence - it's totally safe and children see it as a real adventure! 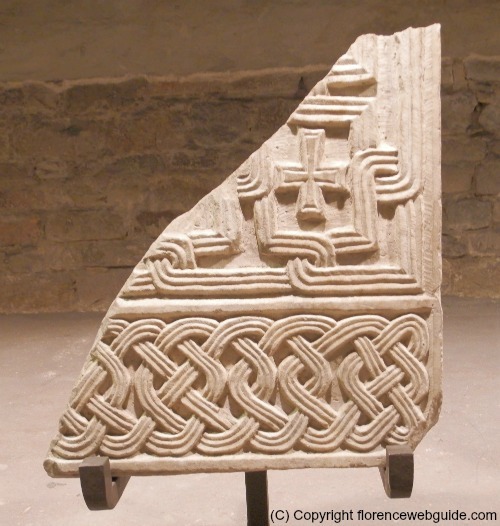 The crypt of Santa Reparata is the archaeological site of the first cathedral of Firenze. Before the Florence Duomo was built, the city’s main basilica was named ‘Santa Reparata’ and was located on the same spot, but was much smaller. The cathedral Santa Maria del Fiore was eventually built on top of the site of this former church which was built some time around the 6th century. Archaeological digs in the 60's and 70's have made it possible to now visit the ruins of Santa Reparata, a crypt below the Duomo also containing remains of Roman Florentia from 300-400 AC. 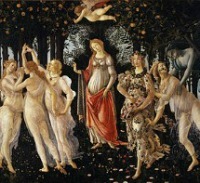 More To Learn about Florence...!